Did you hear a loud boom this morning? That was the sound of dozens of fierce female executives breaking every ceiling in their companies. More than 40 MAKERS@ board members raised their voices at the 2018 MAKERS Conference and each announced a powerful initiative to advance women in the workplace. Representing the top brands in tech, business, media, and entertainment, the influential group of women publicly declared they will push the movement forward by supporting more women-led businesses, investing in more girls in STEM, achieving pay parity and more. MAKERS@ is a network of companies who are celebrating and empowering the game-changing females in their ranks. Through their partnership with MAKERS, brands unite the changeMAKERS within their organization and provide them with tools and inspiration to make bold changes in their professional lives and within their communities. Watch how women make change happen and read all of the pledges below. If you want to #RAISEYOURVOICE for women at your company and join the MAKERS movement, please contact sanna.sharp@makers.com. At 23andMe, we pledge to increase our female representation in our product and engineering teams to better reflect our overall diversity (company is over 50% female). 72andSunny will continue their mission to expand and diversify the creative class. We pledge to maintain our global leadership balance of at least 50% female and to continue to expand our programs that expose high school students of diverse backgrounds (ethnic, socioeconomic, and geographic) to career opportunities within the creative industry— the jobs of the future. I am committed to ending gender bias and cultural stereotypes in marketing, communications, and advertising. The goal is to eliminate bias in everything we create at Accenture and to partner with others in the industry to do the same by establishing industry benchmarks and metrics. Our attitude: You see it. You eliminate it. Adobe will achieve pay parity between women and men globally this year. All Aetna Executives will mentor or sponsor at least one high-potential woman. As the 1st to include GEM as an integral part of our copy testing, AT&T pledges to improve the portrayal of women in our ads by 20% by the end of this year. That accelerates the ANA industry initiative #SeeHer goal by 2-years. I pledge to develop a peer-mentoring program designed to boost presentation skills, business and strategic acumen and exposure. In coming months Bloomberg will launch the definitive data visualization on the female candidates for governorships and congress across the country. We will map the key races, detail the people and provide a visual assessment on the changing landscape for women leadership in national politics. You can view Bloomberg's data visualization on the female governorship & congressional candidates of 2018 here. CA pledges to conduct a policy and process audit across the company to evaluate for possible areas of bias and implement solutions to remove bias where it exists. We pledge to help close the gender gap in tech by getting more girls into STEM and by equipping 12,000 Cognizant women across North America in 2018 with the critical digital skills needed to advance at all stages of their careers. I pledge to support female owned businesses as vendors and in our own supply and distribution chains, with 100% gender parity in bids and at least 75% of them resulting in female-owned business contracts. We know by supporting women, we help support their families, communities and stimulate job creation in the local economy. We pledge to launch and develop a sponsorship program for high-performing, high-potential diverse employees at Getty Images, 50% or more of whom are women, leveraging the reach and influence of our Makers@ attendees and our senior leadership team. Hulu pledges to double the resources dedicated to our internal women's group, 'Hula,' so it can provide more education and leadership-building opportunities in 2018. We also pledge to establish a Diversity Liaison to further focus our efforts and initiatives related to the diversity of our workforce. 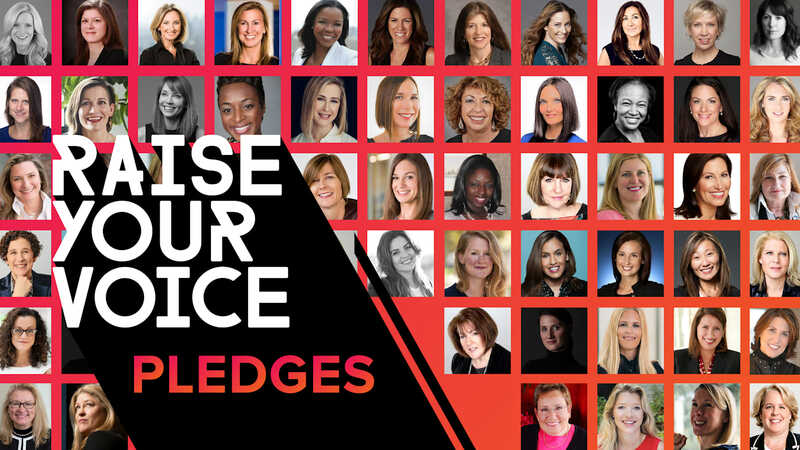 I pledge along with my peers at iHeart to expand our Women's Initiative Network with a roadshow around the nation to 32 of our iHeartMedia regional offices large and small to help mentor, understand and support women in the company through the simple, yet transformative power of conversation and connection. I pledge that in 2018 I will establish gender equity as a strategic objective for the enterprise by launching a program focused on promoting and elevating our female executive population and by 2023 we will have Increased the rate of retention and recruitment for female executives by 10%. I commit to dedicating a substantial part of my practice to defending women who are threatened or sued for coming forward and sharing their #MeToo stories. Lightspeed is a venture capital firm that believes that the most successful companies benefit from employees, executives and Board members with diverse backgrounds and experiences. To that end, this week Lightspeed is publicly announcing our initiative asking founders within our portfolio to commit to build teams at every level of their organization that reflect diversity. I will work to leverage the creative and buying power of L'Oreal USA's media to promote the accurate portrayal of women so that we can more fully #SeeHer. I pledge to create a coaching and support program for new moms returning to LinkedIn from maternity leave. At lululemon, we stand for pay equity: equal pay for equal work. We have committed to closing any gaps by April 2018 which is part of our journey to create an environment that truly reflects equality and inclusivity for our people. MailChimp is committed to elevating women's voices through sponsorship. Our Senior Leadership Team pledges to support our employee-run Women's Empowerment Group through mentorship and full funding. Our Corporate Citizenship team has committed half of its sponsorship budget to women-focused or founded events, and we will only consider funding or presenting at events that have more than 40% women speakers, as well as a code of conduct. As a Brand whose purpose is in service of girls, we pledge that we will launch at least TEN role model dolls each year featuring under-represented careers, real life Sheroes from around the world, and important women in history...Because, imagining that she can be anything is just the beginning, actually seeing that she can makes all the difference. On behalf of MediaLink's Talent practice, we pledge to put forth a diverse candidate slate for every executive and board search assignment. Personally, I pledge to continue to mentor young women, and to promote and celebrate women's capabilities and achievements across the board. I pledge three things: 1) to help my department audit our external consultant, advisor and agency teams to affect that at least 50% are women; 2) I personally pledge to join the Electing Women Alliance and the giving circle in the Bay Area to help women get elected across the country; and 3) I personally pledge to make a loan to a women entrepreneur on kiva.org. I pledge that by the end of 2020 the number of female-led companies we partner with will equal the number of male-led companies. We pledge to "MAKE MOBILITY MATTER" by prioritizing the career development and advancement of our high performing / high potential women (and diverse talent) to accelerate growth and progress against our 50/50 gender diversity by 2020 goal. I pledge to publicly disclose our gender statistics across all levels in the US by June. I pledge to launch an company initiative focused on gender equality and inclusion that includes a focus on action, so that we are not just talking about the issues, but moving toward activating change as well. RGA will raise retention of women of color by 50% through creating a true culture of belonging. As an organization that is 85% female, with 79% of leadership roles filled by women, we pledge to implement training and education sessions focused on fostering empathy and connection to create true intersectionality across the company. RRE Pledges to launch a community initiative with other VCs that promotes diversity, inclusion, and empowerment of women and underrepresented groups. We aim for this initiative to touch over 1000 members of the tech community in NYC. At Sleep Number, we will have gender parity in our stores by 2020 (today it is 38% female). The Female Quotient pledges to partner with at least 50 Fortune 500 companies by 2020 to create and implement solutions for advancing gender equality and rewrite the rules of the workplace. We are committed to working together with conscious business leaders to close the wage gap, create company cultures of care and most importantly, put more women in every equation. Turner pledges to increase our representation of women and people of color in our overall leadership roles. In 2017, Twitter pledged to build a more inclusive and diverse Twitter by increasing the percentage of women overall to 38%, the percentage of women in leadership to 31%, and the percentage of women in technical positions to 17%. UBS pledges to achieve 30% representation of women in senior leadership roles by 2020. UM pledges that we will double the number of women of color in our organization across all levels. As co-founder of #Seeher, I pledge to increase the GEM scores (Gender Equality Measure is the ad-industry version of Six Sigma, scoring ads/entertainment based on how they depict women) of our ANA members and content partners 20% by 2020. We will offer annual development training and experiences for both senior and emerging female leaders, reaching over 60% of VP+ women by the end of 2018 and 100% by 2020.